and Enforcement of Judgments in Civil and Commercial Matters. Regulation 44/2001 left much of the Convention unaltered, but parts were also modified inter alia in order to take into account decisions of the European Court of Justice. 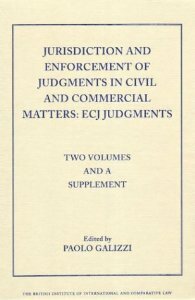 These two volumes contain over 100 decisions of the European Court of Justice on the interpretation of the Brussels Convention from 1976 onwards, as well as the Advocate Generals' opinions for each case. The provisions of the Convention cannot be properly understood and applied without reference to this case law. The case law of the ECJ will also continue to be of fundamental importance due to its relevance to a proper understanding of the provisions of the new Regulation. This book thus provides an essential tool to those interested in the 'new' Regulation and its spirit of continuity from the 'old' European rules on jurisdiction and the enforcement of judgments in civil and commercial matters. The full price for this book when not purchased via the website is: Members £81 Non-Members £135. "Jurisdiction & Enforcement of Judgements..."